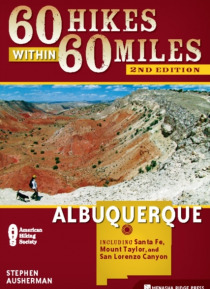 This newly updated and revised edition of 60 Hikes within 60 Miles: Albuquerque hits classic trails and uncovers paths where no guidebook has gone before. This is the essential guide to north-central New Mexico, from the black lava badlands in El Malpais National Monument to the cool aspens in Santa Fe National Forest. Explore newly opened lands in the Ojito Wilderness and the Valles Caldera, or r… evisit the past with nostalgic walks along the Rio Grande and Route 66. Hikes lead to ancient pueblos, ghost towns, slot canyons, strange hoodoos and other treasures in the heart of New Mexico, all just a daytrip or less from the Duke City.Each chapter serves as both a navigational aide and an interpretive guide to familiarize hikers with wondrous destinations in the Land of Enchantment. From the black lava badlands in El Malpais National Monument to the aspen trees in Santa Fe National Forest, the Albuquerque area is filled with beautiful wilderness perfect for exploration. This comprehensive guidebook outlines the level of difficulty for each hike, and includes extensive maps and trail profiles to assist hiking enthusiasts and day-trippers alike. Experience the Rio Grande, old Route 66, ancient pueblos, ghost towns, and other charms of the area with this essential guide.